The album is a fascinating look at government posters dealing with everything from not talking about movements of men, material, etc, to encouraging women to work in factories or join the military, to saving metal, to planting gardens, to just about everything you can think of. The collection is over 2800 different posters and is just an amazing look at how all consuming the war effort was. 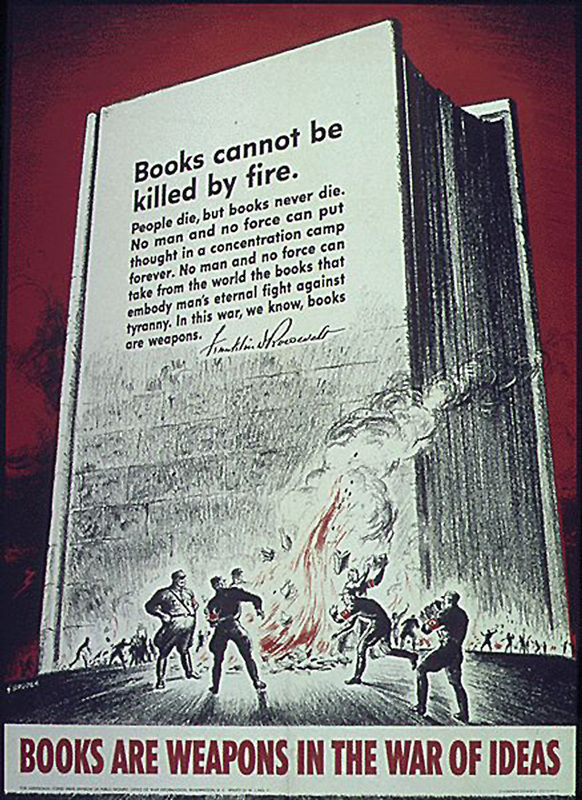 The poster was probably in response to the book burnings in Nazi Germany. The black-lists … ranged from Bebel, Bernstein, Preuss, and Rathenau through Einstein, Freud, Brecht, Brod, Döblin, Kaiser, the Mann brothers, Zweig, Plievier, Ossietzky, Remarque, Schnitzler, and Tucholsky, to Barlach, Bergengruen, Broch, Hoffmannsthal, Kästner, Kasack, Kesten, Kraus, Lasker-Schüler, Unruh, Werfel, Zuckmayer, and Hesse. The catalogue went back far enough to include literature from Heine and Marx to Kafka. That got us to thinking. How are the book burnings back then any different than what we see today from schools, colleges, Twitter, Google, Facebook, etc.? The book burnings took ideas away from the people and sent them up in smoke. Unable to deal with thinkers and ideas of which the government did not approve, a government simply got rid of books and the ideas. Schools ban certain books. Libraries remove books because they might offend someone. College students run around screaming that people must be kept off campus and silenced because of the ideas the people have that are contrary to theirs. Twitter, Google, and Facebook are admitting they are banning certain speech based on its content. It seems that we are in an age of “digital book burning” if not in the real sense, certainly in the practical sense. 418,500 Americans died fighting against the idea of banning books and banning ideas. We now look around and wonder what they died for. This is a great subject as books need to be read. I can’t help but wonder how many young (grade school) children get to read a book out loud either at home or in the classroom? To look at a book and feel a book’s cover when you pick it up or in opening a book you use a couple of your learning senses; then just think when you read it out loud you can hear and connect with knowledge.